This level has easy difficulty and you need to use good strategy to complete this level. 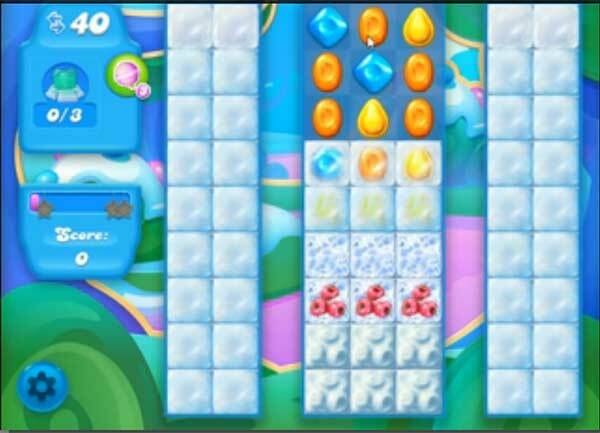 For this level you should try to play from center and break the snow. After as you have more candies to play then try to make striped candy or fish by making square of four same color candies and combine them with color if you get the chance to break more snow. After break snow where you find bear body part instead of breaking all snow to reach the target within 40 moves. I quit watching when you got down to 9 moves. WHY–Because it is now only 30 moves so you didn’t pass the level. Also, I will go 5-7 moves without moving down the center portion. You moved down every move unless you intentionally made a move near the top. I am not going to wait around for a ‘good’ board now that it is only 30 moves. I have never cleared any of the bears, including the pink one. I get way to many moves at the top that doesn’t help.